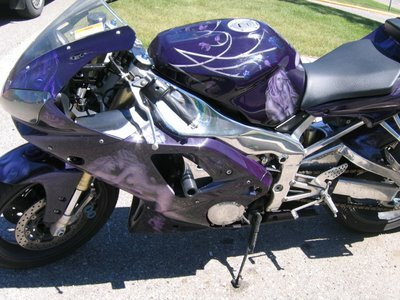 Crazy Lesbian Motorcycle! | Separated by a common language. Check out this sweet motorcycle that’s been sitting outside of the hospital I work at for the past 3 weeks! I’ve been trying to find out who drives it and finally last weekend I saw him. In one word: dorksauce! It looks like he works at a hot dog stand. So odd! That motorcycle is only really a lesbian if it can resist me. There is something ‘special’ about a man who rides a bike like this. Love the reflection of your scrubs and shoes…I hope he didn’t see you taking pictures of his ride – he would probably find that a turn on. But then you could add one more workplace weirdo trying to take you home.